When we last left our intrepid wine tasters, they were finishing a mid-day meal at La Figueres in Gratallops. You can read about our tasting at Clos Figueras here and the early morning tasting at Sao del Coster here. As we stabbed the last piece of sausage (and that did not come out like I had hoped), we were approached by Jordi from Celler Devinssi, the last stop of the day. Jordi would wait in the truck outside for us which was a bit more than he needed to do. So, we finished our meal and wandered outside to meet up with Jordi. Jordi is a Russian-born, tourism-trained wine guy. We couldn’t quite understand how he actually ended up in Priorat but like so many others, he came for a bit of a stay and hasn’t left. Probably something to do with love. We hopped in the truck which had stayed running with the A/C on to keep the wine cool. Attention to detail, baby. Jordi had a bunch of wine in the truck – he told us that he was taking us up into the vineyard to taste and talk. Leaving the village, we exited the paved road at the same juncture as we had with Xavi of Sao del Coster and wound our way up and around through anonymous vineyards and olive groves until Jordi stopped at a little wooden building. We got out, he took the wine, we took the glasses and we walked up a terrace or two to find a barrel at a bit of a clearing. How cool was this? The sun had started to break through some cloud cover, Gratallops in the distance with a ray of sunlight on it, it was warm and toasty, we had a mild buzz on, and we were about to drink……er….taste some wine with our new best friend, Jordi. Jordi was delightful. 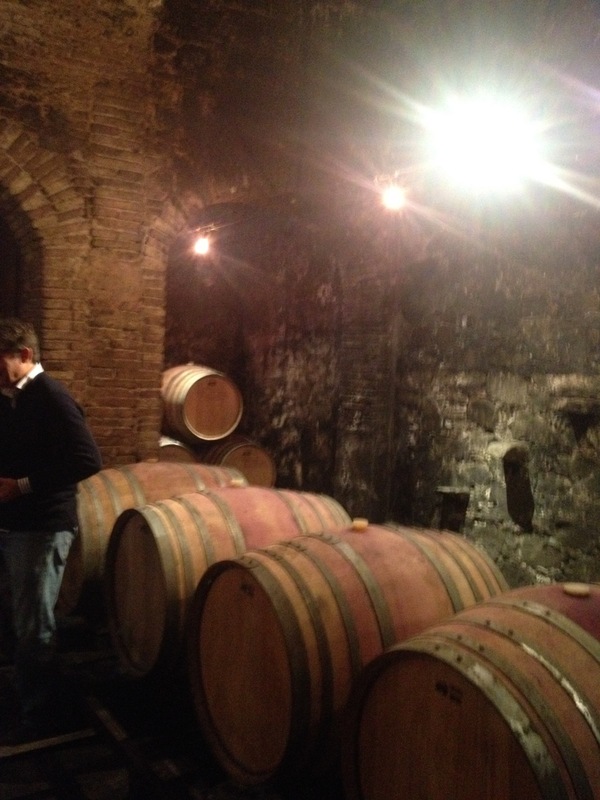 Cellar Divinssi: A little history of Celler Devinssi is needed. 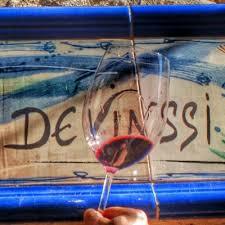 Celler Devinssi was founded in 2000 by Josep Roca Benito from Barcelona. He was a wine merchant and became aware of the region through contacts in the business. After three years of rehabilitating the vineyard, they bottled their first vintage. Capacity at the winery is about 10,000 bottles – a true garage wine enterprise. Most of their vineyards are planted to Garnatxa and Cariñena. But, there are some white grape vines planted as well in limited number. There is a great interview with Josep from their website here. Jordi started us off with the white – 2013 Mas de les Valls Blanc. This is a village wine or vi de la vila – in this case – Gratallops. It definitely shows the Pedro Ximenez as I noted immediately the sherry (nutty) quality to this dry wine. The other grape is Garnatxa Blanc – lending a Rhoney vibe to it too. A nice combination of experiences. This wine would be a warm weather wine. Maybe afternoon sun – as we were experiencing. It was dry and moderately crisp. There were only 600 bottles made. Before I get into the reds, there’s something I need to get off my chest – wine glasses at tasting rooms. In my travels, I have been blessed with many great tasting experiences. But, there have been too many where the winery has lousy wine glasses. I’m not suggesting that everyone go out there and get numerous Reidel glasses to perfectly match the wine varieties eg. the Blaufränkisch glass. But, for crying out loud – get something that’s not sold at Walmart for $12 a case! What does that have to do with Devinssi? Well, they are small and still they use wine glasses that are very good quality for their tasting. 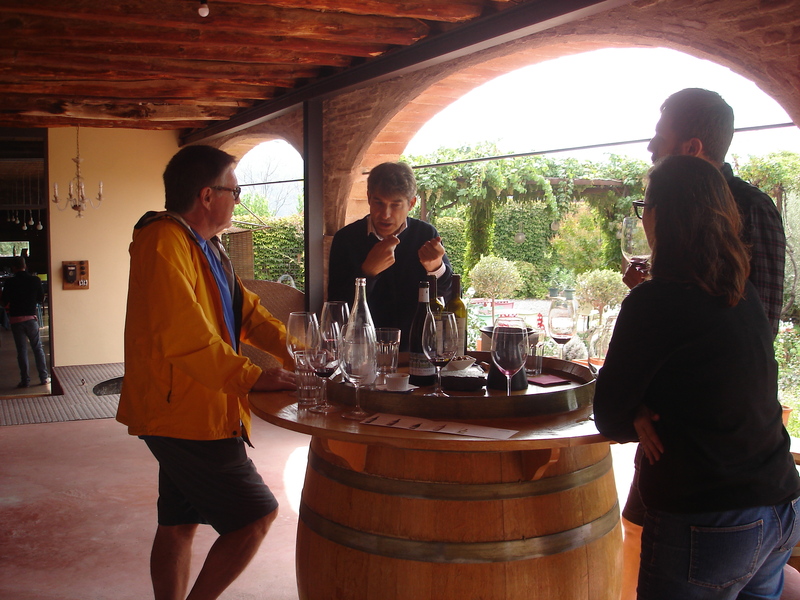 In fact, all the wineries we entered in Priorat had good quality wine glasses, one wine per glass and no tasting fee. If I had a winery, I’d want my clients to have an optimum experience tasting my wines. And, I wouldn’t want some Canadian blogger bitching about the glasses. But, that’s just me. The first red that we had was their most popular red, I’d bet – 2013 Mas de les Valls Negre. This is a blend of Cariñena and Garnatxa with some Cabernet Sauvignon thrown in. Now, if you’ve sipped swirled and either spit or swallowed a bunch of wine in a day, you know that your buds don’t always cooperate. You just can’t feel it. This was such a sip and spit. So, rather than miss the mark, I’m going to use their web site to provide tasting notes – “12 months in 225 litre French and American oak casks…..fragrance of fresh and macerated cherries, black fruit jam….vanilla and mild touches of timber. In the mouth, it shows appropriate acidity and a certain fattiness and long palate.” I did notice the acidity. Don’t remember the oak at all. The next red was their 2012 Il.Lia. Garnatxa, Cariñena and Cabernet Sauvignon fermented separately in oak. This definitely had more oak treatment, quite dry, tannins evident. This is a cellar wine. From their web site, “French oak – 225 litres casks are used for aging….it emphasizes black fruit, ripe plums, cherries….In the mouth it shows well balanced, well structured, beefy, fatty, and wide taste.” I liked it and planned to take some back to Canada to test my hypothesis on cellar time but it didn’t make it through the trip – we consumed all of it a few days later. We returned to Gratallops via a different route. Jordi showed us the Clos Mogador vineyards and some olive groves. He made an interesting comment as we passed a mature vineyard with irrigation lines. Jordi said that the winemaker shouldn’t irrigate mature stock – he actually shamed the winemaker. Apparently irrigation is frowned upon – the nature of DOQ Priorat is to allow the harsh conditions to encourage power and depth that irrigation can reduce. We toured the cellar facility. You need to know that the tour doesn’t last long as the cellar is in an old stone olive mill – two stories with an office and showroom/retail space upstairs and the barrel room and cellar on the ground level straight off the street. The staff (there are three, including Jordi) were there cleaning the first floor and readying the equipment for the first of the harvest. One guy’s wife was there to help. Many wineries use the word ‘artisanal’ in describing the vibe, processes, and outcomes of their winery. Well, I’m not sure there’s a winery that’s anymore artisanal than Devinssi. When I think of the word, I think of people lovingly using their hands to craft a product from select ingredients or materials – be it cheese, wine, clothing, olive oil, or anything else. I don’t envision exhaust spewing harvesters, food scientists, or spiffy bottling lines. Well, you don’t get much of that at many Priorat wineries but Devinssi takes it a bit further. Their bottling ‘line’ is a small table with a hose. Cork it up one bottle at a time as you would at your local ‘homemade’ wine/beer store with a lever. Affix each label through the use of a small template holder for the bottle and a wet sponge. One bottle painstakingly at a time. Now, that’s not necessarily the key to making great wine but twinned with a similar ‘hands on’ approach in the vineyard, a solid site, older vines, and a level of expertise, it does work in this instance. It’s very cool to see. If you get to Gratallops and you must, schedule some time at Devinssi and tell Jordi I sent you. You will get……well nothing that you wouldn’t get anyway but mention me anyway. After all he is my new BFF. 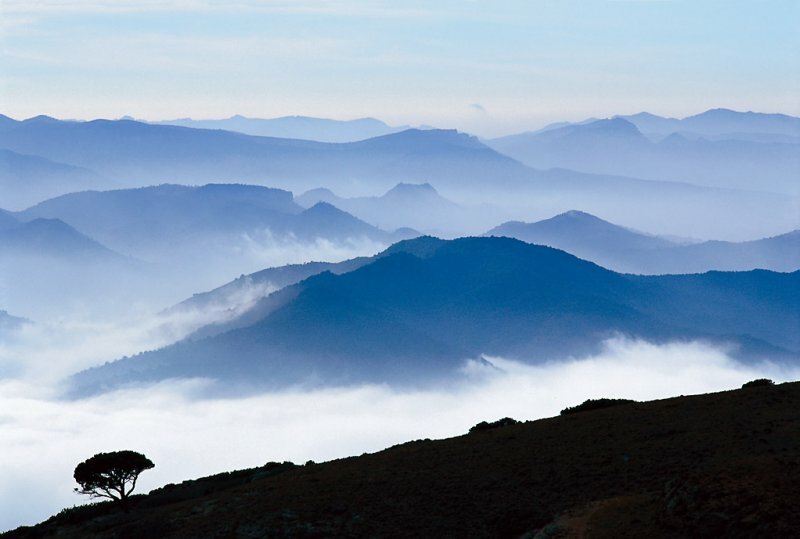 Here’s my penultimate pic of the Monsants. An Update: Last post, I tried to explain the meaning of ‘Gratallops’. I was excited to see that someone had actually read the post and took the time to educate me. Sinisa Curavic from http://www.catalan365.wordpress.com informed me that ‘gratar’ means scratching in Catalan and ‘llops’ means wolves. So, ‘scratching wolves’. Thanks to Sinisa Curavic (check them out if you are planning on a wine trip to Catalunya). This is the fourth post on my trip to Priorat. I know that I talked about the Monsant Mountains and Natural Park a few posts ago. You can read it here. And, this post isn’t about the topography but a winery. But, I don’t think that you paid enough attention to the Montsants before. I’m figuratively pulling the car over so you can get out and take another gape. Really understand it. We may have to do this again. They are très cool. 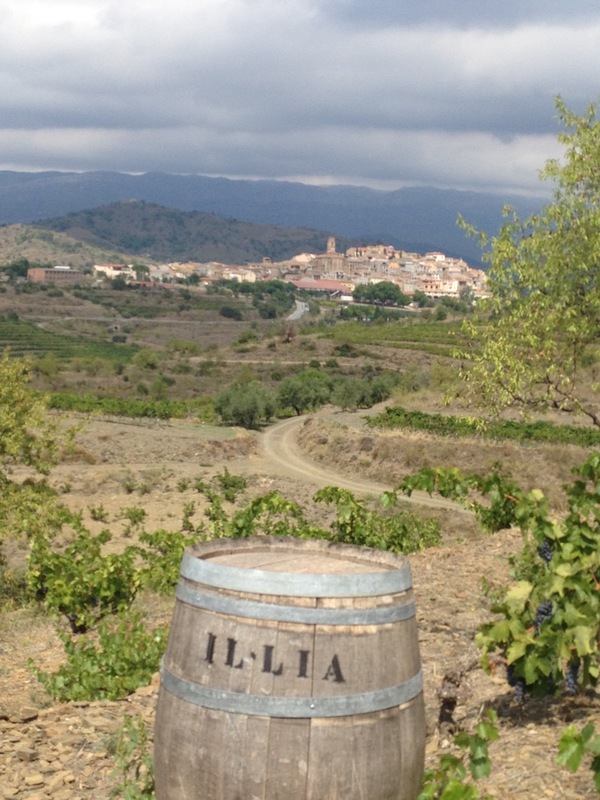 On our third, and last, day in Priorat we visited three wineries in Gatallops. We were escorted by Timmer Brown of Catalunya Wine (@catalunyawine & http://www.catalunyawine.com ). If your interest in Catalunya wine has been piqued by my posts, visit Timmer’s site to learn more. Last time out it was Sao del Coster. You can view my post on our visit here. Before I start this post – here’s a quiz. How do you pronounce Gratallops? And what does it mean? Anyone? Buehler? Buehler? I didn’t think so. We were told by one Prioratite (Prioratarian? Priorater?) or maybe it was Timmer that told us that Gratallops meant: Grata as in the Latin gratis – ‘free’ and llops as in the Latin lupus – ‘wolf’. So, ‘free of wolves’. Pronunciation we heard was varied but I believe it’s GRAT-a-yops. If there is a Catalan pronunciation expert out there, let me know. Lesson over. After we finished up at Sao del Coster, we wandered down the street a block or two to the winery, Clos Figueras. 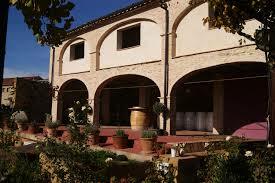 Clos Figueras is more of a stand alone winery but still within the village. It includes a lovely restaurant and has a few rooms for sleep overs. The history of this winery bears some explanation. Although each and every winery we visited had a personality unlike the others, Clos Figueras adds the presence of a human personality in the person of Christopher Cannan. Christopher Cannan founded the wine export company, Europvin, back in the 80’s, I believe. He experienced the early attempts by winemakers to ‘up the game’ in Priorat through such wines as Scala Dei, loved them, and was encouraged by René Barbier (of Clos Mogador) to establish a winery with the purchase of an abandoned vineyard and olive grove just north of Gratallops. The vineyard has been painstakingly rehabilitated and expanded. 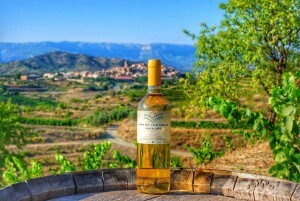 Clos Figueras produces about 30,000 bottles annually along with olive oil. Initially, Rene Barbier was the winemaker but Christopher has filled that role himself for awhile now. They primarily focus on Garnatxa but they have a significant plot of Viognier (not that common in Priorat) and make a brilliant white blend too. Syrah, Cariñena, and Cabernet Sauvignon are also planted. We met up with Miguel, the head of marketing for Clos Figueras. He told us a bit about the history of the winery. Miguel has such an enthusiasm for wine and, in particular, what they are achieving at Clos Figueras. Expressively outlining the history, the present state, and their ambitions. It was both informative and a bit of a tease. Bill wants wine! He showed us the fermentation premises with both stainless steel and primary plastic tanks. Not unlike Sao del Coster, this was a pretty cramped space and tanks were wheeled around to accommodate switching things up. He then invited us to the barrel room. The barrel room is in an old cistern. Oh yeah, you should know that Clos Figueras is in an old chicken coop. That’s right. It was a chicken coop before a winery. This prompted me to attempt numerous chicken related jokes as I penned this. “Miguel laid an egg when he explained the…..” “We were on the lookout for chicks?” “The pecking order in their wine levels is….” Now, there aren’t any indications other than the style of construction that would lead you to believe that you are in a chicken coop. It is quite winery-like now. Back to the barrel room – it is in an old brick lined cistern under the ground. It was pumped out, cleaned of sludge and such and rehabilitated like their vineyard. We lifted a steel trap door and walked the fifteen feet down a steel spiral staircase into the barrel room. It was unusual but it seemed a perfect fit vibe-wise and we were told a perfect fit for the wine to age (humidity, temperature, etc.). We were joined on our tour by Miquel Hudin. Miquel is the author of the vinologue series (link below) of regional winery reviews. 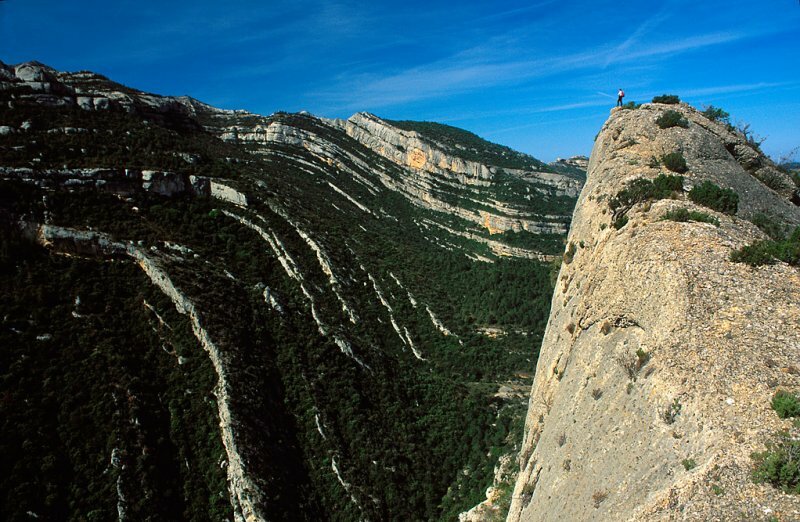 His guide to Priorat was indispensable for our planning and initial understanding of this region. Miguel, that’s Miguel not Miquel, told us about the different wines that were sleeping and we tasted several from barrel. In particular, we had straight up Syrah (I believe 2013). Loved the spiciness and structure. It could be a single variety wine almost Northern Rhone-like but will be used as a blending partner. 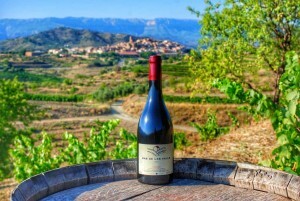 Clos Figueras uses up to 20% Syrah in their blends. Enough of the underground, it was a nice day outside and we were thirsty. Bill wants wine! Up the stairs, make sure no one is left below, drop the trap door and pop a cork or two! Miguel eloquently explaining to me the essence of life. It’s wine of course. We dove right in with some olives. I do love olives – these were Arbequino – my faves – some bread and charcuterie. Clos Figueras, like most of the other Priorat wineries have several ranges of wines. We started with the – 2013 Serras del Priorat. An interesting thing about this wine is the packaging. Christopher Cannon’s daughter has taken over some of the marketing activity and has given this a hipper/more modern vibe in a burgundy shaped bottle. It’s a fresh wine with primary fruit being red ones – cherries, raspberries. A long finish for this weight. A hit of acidity – food friendly. If you are into ‘professional’ scores this has received several in the 90’s. Under 20€. The next level up is the Font de la Figuera line. It has both red (negre) and white (blanc) blends. The white was very floral channeling the Viognier – in the Rhone white style. Now this isn’t going to come out right but this wine isn’t in the ‘blah’ style of many white wines that we sampled in Priorat. It had depth we hadn’t seen much of up until then. I think this proves that there is promise here and with the passion we experienced, they will find their white wine stride. Approx. 21€. We tasted two vintages of the Font de la Figuera negre – 2011 and 2013. Reviews were mixed. I liked the ’11, some of the others preferred the ’13. The consistent thing in these wines is depth again, a richness that you can count on with most mid-range Priorat reds that try to feature the Garnatxa. The depth exceeds the price point in most cases. Fruit front and centre – some leathery accents particularly in the ’11. Approx. 21€. 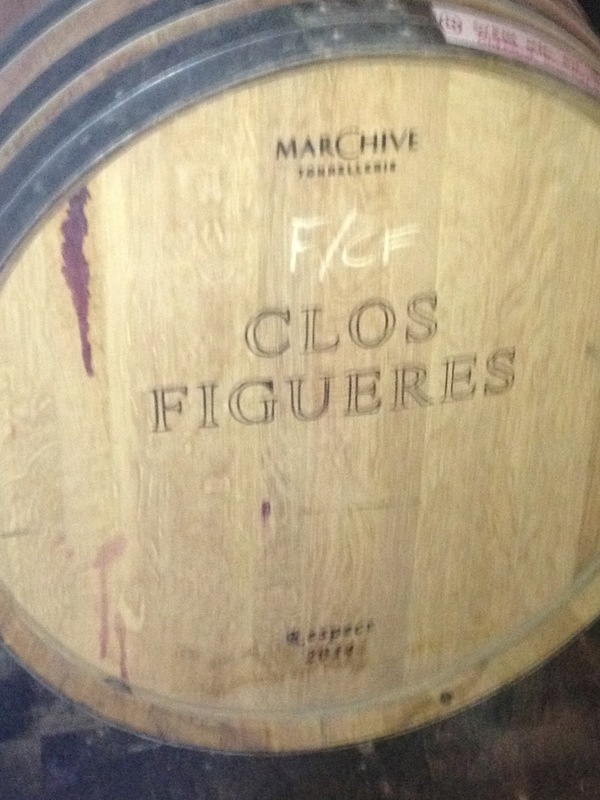 We were unable to taste the flagship wine of the winery – the Clos Figueras – the 2008 vintage is now being sold. It retails around 50€. We finished our tasting and on to lunch at the restaurant on site – Les Figueres. The restaurant is very well appointed. You can dine al fresco or inside. We chose inside. Timmer had to dash with his beautiful main squeeze and their little toddler (I remember those days of young children. I lie. I don’t remember them at all – maybe the effect of recreational drug use?). Before he left, I presented Timmer with his very own Toronto Maple Leafs cap – goodwill in abundance until he tires of me. Timmer ordered our lunch which in the local style was a lot of food. A lot of food. A beautiful tomato salad dressed plainly with olive oil just like we love it. Some calamari. Then a large plate of sausages and grilled peppers – it was YUUUUGE, Caroline. We passed on the wine with lunch as we had one more winery to do before we wobbled out of town on our way to Falset. 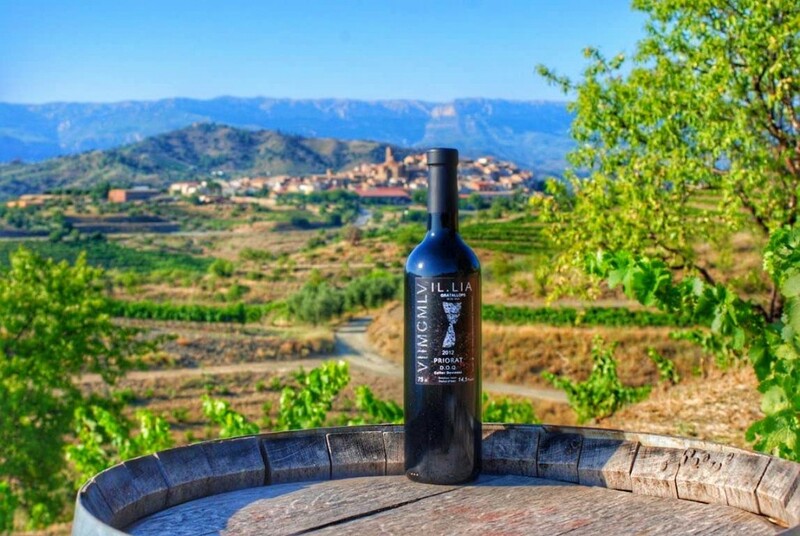 Clos Figueras is a one stop destination for great wine, enthusiastic knowledgable staff, great typical Catalan food, and a nice setting to sit and appreciate how lucky you are. BTW, I am. I’d think a must visit if you are venturing to Gratallops. Call or email ahead as tours/tastings are by appointment.